Chris Bosh is optimistic about rejoining the Miami Heat in training camp. Miami Heat star forward Chris Bosh believes he is ready to return to the team after a health scare with blood clots that sidelined him for a second season, he tells the Open Run podcast. Bosh still needs to be cleared by the Heat before he can resume training with the team. Miami has not commented on Bosh's status since they ruled him out for the remainder of the season in May. Last year, a blood clot traveled to Bosh’s lung, which required hospitalization. This past season, Bosh was attempting to return—creating friction between him and the team—until he was ultimately shut down during the playoffs. 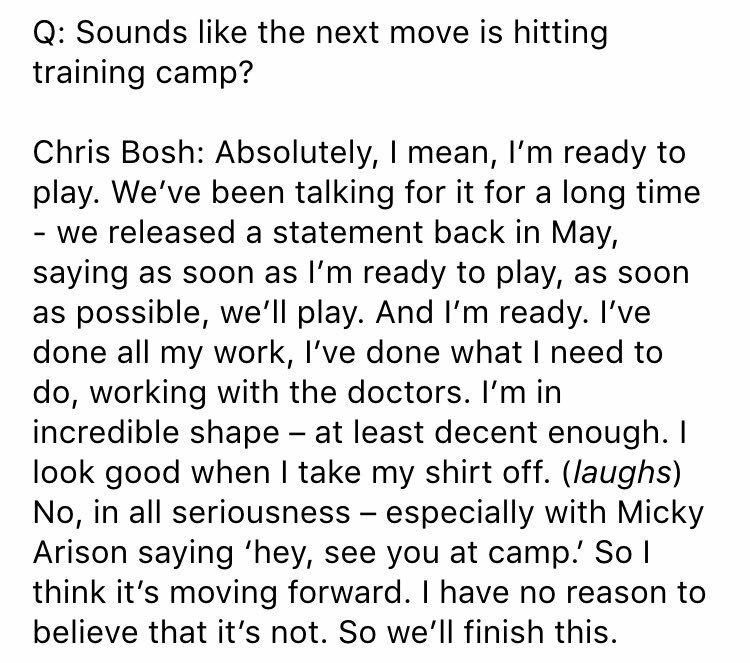 Managing general partner Micky Arison tweeted at Bosh "look forward to seeing in camp" on Aug. 31. Bosh has three years and roughly $75 million left on his contract. The Heat open training camp on Sept. 26. Bosh has a documentary chronicling his return and recovery, which will appear online on Sept. 21.